Guess what is finally on the frame? I got started quilting it and I’m at the “I hate it!” stage. Here is a peek at the center. I think I might need to double the quilting here. I’m hoping to finish this after church. Then maybe I will start liking it again! I usually do. I have 13 more units to piece and then I will begin putting them together. I hope to do at least a couple tonight. This entry was posted in Brinton Hall, EPP, Uncategorized. Bookmark the permalink. Brinton Hall is looking great! 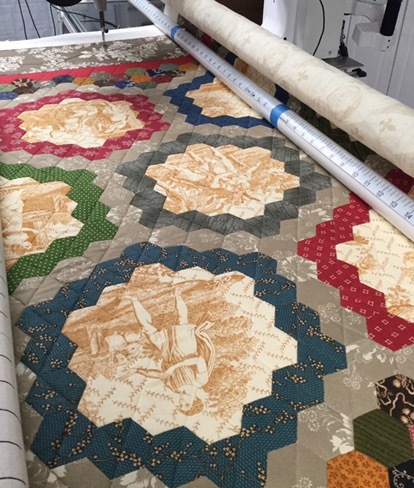 Cannot wait to see it all quilted…..I know you and I share a similar love/hate relationship with our quilts in progress…and, in the end, for the most part, ending up loving the finished projects….so keep the faith…you will love this one again….it is going to be an amazing quilt!!! 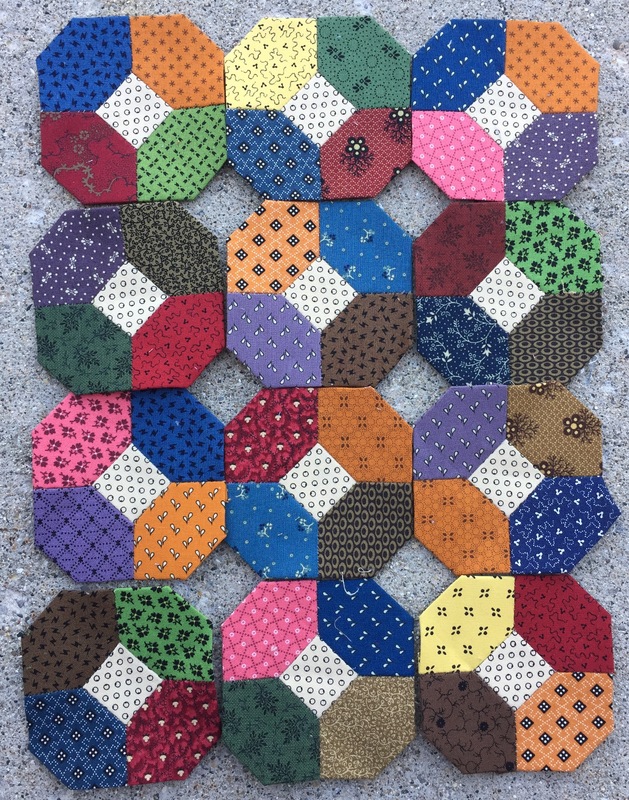 Your little EPP blocks make me smile…my favorites fabrics are Civil War repro…looking forward to seeing this all done…. Oh, my goodness! What’s not to love, Katy?? I’m really looking forward to seeing the end results. And that little EPP??? Oh my! I think we are familiar with the “I hate it” stage, when the quilt is really agitating for you to do something different or more. Love the scrappy EPP project! They both look so pretty. I like the cross-hatch quilting. Two great works in progress Katy ! Great progress on beautiful quilts Katy! 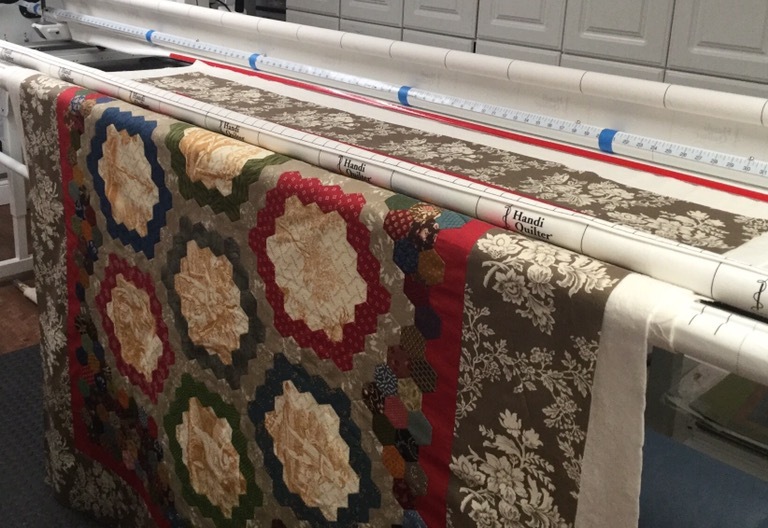 Did you use a certain line of colors on your EPP quilt? They are so yummy! The quilting looks great and you’ll be finished before you know it. Love all the bright colors in your EPP project. Happy stitching! It has been fun watching your project develop to this stage….I love it and I am sure you will too, soon!!! I like your new EPP project as well. I don’t see anything to hate about that quilt on the frame! It is lovely. And I really like the look you are creating with your EPP. Very nice. Gives me some ideas, too. I have found you through Slow Stitching Link. I love the EPP project. Your quilting project is lovely and I’m sure it will all work out in the end. I’m confident you’ll soon be at the love it stage; it’s a beauty! An EPP project is calling to me, especially when I see your blocks. Those colors just pop! Can’t wait to see the finished quilt! Enjoy your Sunday!